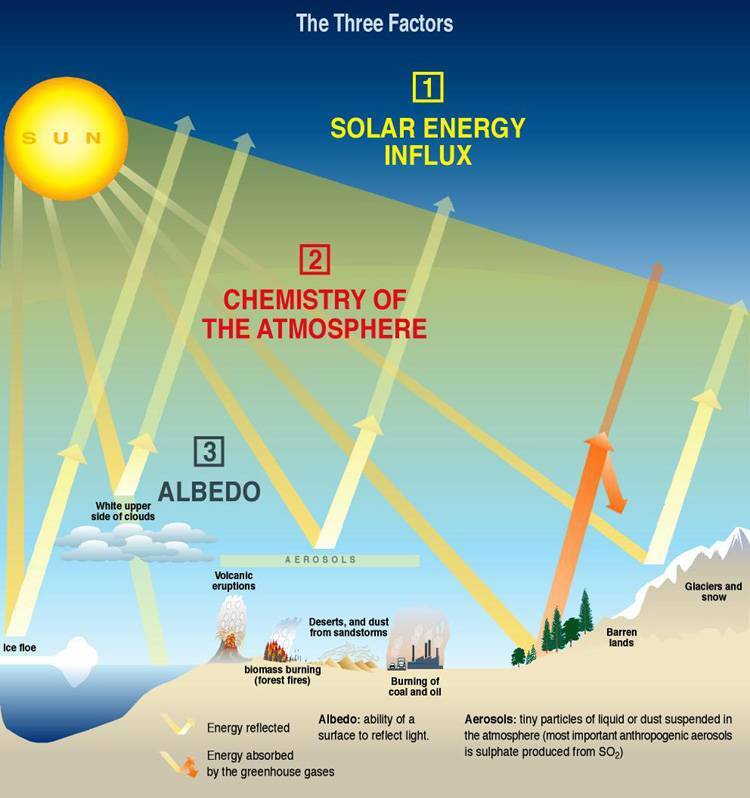 Energy from the Sun reaching the Earth drives almost every known physical and biological cycle in the Earth system. The energy that keeps the earth's surface warm originates from the sun. The primary source of energy to drive our global climate system (including atmospheric and, to a lesser extent, oceanic circulation) is the heat we receive from the Sun, termed solar insolation. The amount of insolation which reaches the Earth's surface depends on site latitude and season. The insolation into a surface is largest when the surface directly faces the Sun. As the angle increases between the direction normal to the surface and the direction of the rays of sunlight, the insolation is reduced in proportion to the cosine of the angle. This is known in optics as Lambert's cosine law. This 'projection effect' is the main reason why the polar regions are much colder than equatorial regions on Earth. On an annual average the poles receive less insolation than does the equator, because at the poles the Earth's surface is angled away from the Sun. The hydrosphere, including the oceans and all other reservoirs of water in liquid form, which are the main source of moisture for precipitation and which exchange gases, such as CO2, and particles, such as salt, with the atmosphere. The land masses, which affect the flow of atmosphere and oceans through their morphology (i.e. topography, vegetation cover and roughness), the hydrological cycle (i.e. their ability to store water) and their radiative properties as matter (solids, liquids, and gases) blown by the winds or ejected from earth's interior in volcanic eruptions. The cryosphere, or the ice component of the climate system, whether on land or at the ocean's surface, that plays a special role in the Earth radiation balance and in determining the properties of the deep ocean. The biota - all forms of life - that through respiration and other chemical interactions affects the composition and physical properties air and water. The biosphere is that part of Earth's atmosphere, land, oceans that supports any living plant, animal, or organism. It is the place where plants and animals, including humans, live. Large quantities of carbon dioxide are exchanged between the land-based biosphere and the atmosphere as plants take in carbon dioxide and give off oxygen, and animals inhale oxygen and exhale carbon dioxide. The Earth has periods of time when the temperature rises (warming cycles) and periods when the temperature drops (cooling cycles) it is a series of natural cycles of our planet. The Sun and it's level of solar activity has an major influence on these cycles. Today climate change and global warming are receiving unprecedented attention due to the possibility that human activity on Earth during the past couple hundred years will lead to significantly large and rapid changes in environmental conditions. The first step in addressing the issue of global warming is to recognize that the warming pattern, if it continues, will probably not be uniform. The term "global warming" only tells part of the story; our attention should be focuses on "global climate change." The real threat may not be the gradual rise in global temperature and sea level, but the redistribution of heat over the Earth's surface. Some spots will warm, while others will cool; these changes, and the accompanying shifts in rainfall patterns, could relocate agricultural regions across the planet. The ocean is a significant influence on Earth's weather and climate. The ocean covers 70% of the global surface. This great reservoir continuously exchanges heat, moisture, and carbon with the atmosphere, driving our weather patterns and influencing the slow, subtle changes in our climate. 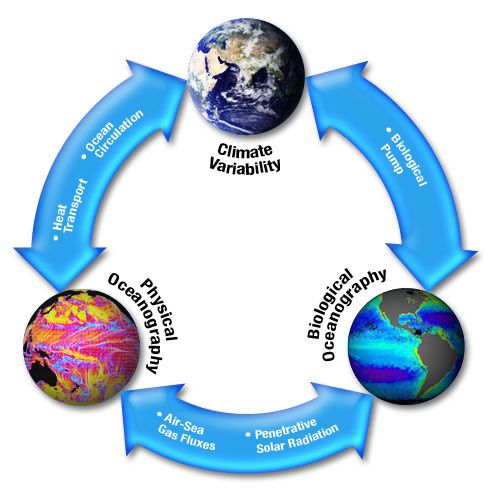 The oceans influence climate by absorbing solar radiationand releasing heat needed to drive the atmospheric circulation, by releasing aerosols that influence cloud cover, by emitting most of the water that falls on land as rain, by absorbing carbon dioxide from the atmosphere and storing it for years to millions of years. The oceans absorb much of the solar energy that reaches earth, and thanks to the high heat capacity of water, the oceans can slowly release heat over many months or years. The oceans store more heat in the uppermost 3 meters (10 feet) that the entire atmosphere, the key to understanding global climate change is inextricably linked to the ocean. Climate is influenced by storage of heat and CARBON DIOXIDE in the ocean, which depends on both physical and biological processes. Let's look at some of these processes. At the end of the last ice age, about 15,000 years ago, and the ice sheets melted away and climate warmed at that time. Ice sheets began to grow, and climate cool about 130,000 years ago at the beginning of the last ice age. About 130,000 years ago, fed by evaporation of ocean waters, the polar ice caps thickened and expanded Earth cooled by almost 12° C and global sea level to drop 130m below its current level. About 15,000 years ago, this process was reversed as more sunlight reached areas near the Arctic Circle, and Earth emerged from the ice age. Earth is about 8° Celsius (14° Fahrenheit) warmer today than it was then. Still recovering from the ice age, global sea level continues to rise. The past century alone has seen global temperature increase by 0.6 degree Celsius (1 degree Fahrenheit), and the average global sea level over the past decade has risen steadily. Is this just part of the natural cycle? How much of this warming is due to the burning of fossil fuels? Is human nature affecting Mother Nature? What should we do? Our response to the challenge of global warming begins by formulating the right set of questions. Climate is effected by both the biological and physical processes of the oceans. In addition, physical and biological processes affect each other creating a complex system. Physical characteristics of heat transport and ocean circulation impact the Earth's climate system. Like a massive 'flywheel' that stabilizes the speed of an engine, the vast amounts of heat in the oceans stabilizes the temperature of Earth. The heat capacity of the ocean is much greater than that of the atmosphere or the land. As a result, the ocean slowly warms in the summer, keeping air cool, and it slowly cools in winter, keeping the air warm. A coastal city like San Francisco has a small range of temperature throughout the year, but a mid-continental city like Fargo, ND has a very wide range of temperatures. The ocean carries substantial heat only to the sub-tropics. Poleward of the sub-tropics, the atmosphere carries most of the heat. Both the ocean and the atmosphere transport roughly equal amounts of heat from Earth's equatorial regions - which are intensely heated by the Sun - toward the icy poles, which receive relatively little solar radiation. The atmosphere transports heat through a complex, worldwide pattern of winds; blowing across the sea surface, these winds drive corresponding patterns of ocean currents. But the ocean currents move more slowly than the winds, and have much higher heat storage capacity. The winds drive ocean circulation transporting warm water to the poles along the sea surface. As the water flows poleward, it releases heat into the atmosphere. In the far North Atlantic, some water sinks to the ocean floor. This water is eventually brought to the surface in many regions by mixing in the ocean, completing the oceanic conveyor belt (see below). Changes in the distribution of heat within the belt are measured on time scales from tens to hundreds of years. While variations close to the ocean surface may induce relatively short-term climate changes, long-term changes in the deep ocean may not be detected for many generations. The ocean is the thermal memory of the climate system. 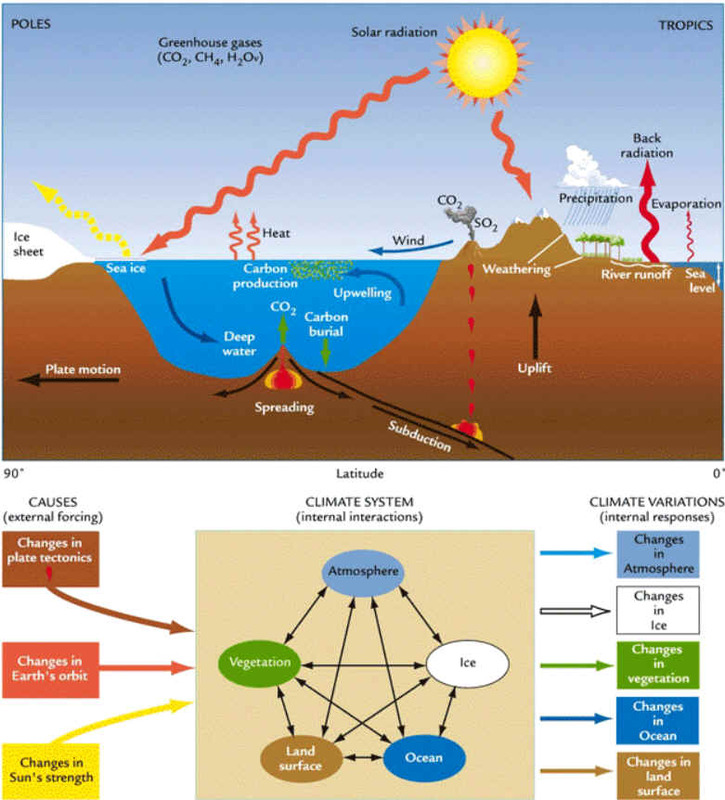 Climate is also influenced by the "biological pump," a biological process in the ocean that impacts concentrations of carbon dioxide in the atmosphere. The oceanic biological productivity is both a source and sink of carbon dioxide, one of the greenhouse gases that control climate. The "biological pump" happens when phytoplankton convert carbon dioxide and nutrients into carbohydrates (reduced carbon). A little of this carbon sinks to the sea floor, where it is buried in the sediments. It stays buried for perhaps millions of years. Oil is just reduced carbon trapped in sediments from millions of years ago. Through photosynthesis, microscopic plants (phytoplankton) assimilate carbon dioxide and nutrients (e.g., nitrate, phosphate, and silicate) into organic carbon (carbohydrates and protein) and release oxygen.